“‘In Bruges’ is the best film of the year so far, and I doubt that praise will be usurped by another film anytime soon.” That’s a quote from my review of the film when it hit theaters in February. It’s been about 5 months since I wrote those words, and there have been many great movies released since then. Does that quote still hold true? And is the DVD on the same level of quality as the film? Find out in my review of In Bruges on DVD. 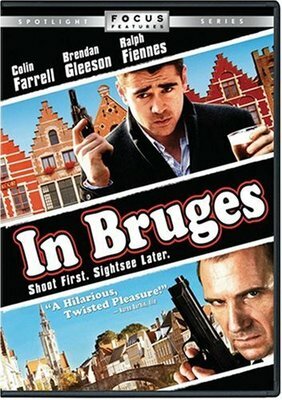 Following a botched hit in London, Irish contract killers Ray (Colin Farrell) and Ken (Brendan Gleeson, aka Mad-Eye Moody in Harry Potter 4) are sent to the quaint Belgian town of Bruges (pronounced “Broozh”) and told to wait for further instructions from their employer, Harry (Ralph Fiennes, aka Voldemort in Harry Potter 4). While Ken takes in the sights and historic medieval villages, Ray is morose and withdrawn, disgruntled with Bruges' lack of nightlife and wracked with guilt over a recent accident. One night, while observing a film production with the dwarf actor Jimmy, Ray meets and falls for Chloë (Clémence Poésy, aka Fleur Delacour in Harry Potter 4....there seems to be a theme here), a local production assistant. Things don’t exactly go swimmingly though, but I would be doing you an injustice by divulging any more information. In Bruges’ greatest strength is its dramatic structure. Written (and directed) by Martin McDonagh, the film follows a narrative structure found rarely in cinema, but something typical of Shakespeare. The plot twists and turns and there’s no way to predict where it is headed; you’re along for the ride, and that’s what’s fun. Unpredictable films usually loose their power on second viewings, but this is not the case with In Bruges. Like a Shakespearean play, the first half of the film establishes many seemingly unconnected plot points and has mass amounts of foreshadowing. There are moments, watching the film a second time, where I was giddy with excitement, recognizing the moments that later come in to play and the lines of dialogue that accidentally predict the future. In the same way Shakespeare slyly hints (over and over) to the end result in Romeo and Juliet, McDonagh cleverly places hints throughout as to what the final outcome will be. In many instances, the film feels like a movie version of a very well-written play; not surprising, given that McDonagh is a highly acclaimed playwright. The film is funny and heartbreaking at the same time. The humor is often dark as night; there’s a grim sense of irony that hangs over the picture. Many humorous parts ultimately lead to darkness that is impossible to laugh at. The film follows the structure of Romeo and Juliet; it starts out as a light-hearted comedy, and then descends into dark tragedy. Balancing dark humor with dark and complex content is often a dangerous combination, but it pays off here in an insanely rewarding way. Colin Farrell, Brendan Gleeson, and Ralph Fiennes all turn in Oscar worthy performances. As the central character, Farrell is spectacular. He’s likeable despite his generally detestable mood, and while he seems like a jerk early on, we will feel his deep pain by the time the film hits the thirty minute mark. Farrell has done some truly terrible crud in the last few years, but he shows how great an actor he is here, and I can’t wait to see what he does next. But this is really Brendan Gleeson’s movie. He’s terrific in everything he co-stars in, and one of the reasons I wanted to see this movie is that it finally puts him in the spotlight as a main character. He takes that role and runs with it. Ken has killed people, but you can tell he’s a good guy. He’s the kind of character you’d like to meet and hang out with. His optimism and affection for tourism is infectious, but his character is also complex. Ken’s nobleness near the end will bring a tear to your eye, and it’s all due to Brendan Gleeson. I know this movie was released too early and was seen by too few people to be up for Oscar consideration, but seriously, Gleeson deserves an Oscar for this role. Voldemort himself (Ralph Fiennes) plays villain Harry, and oh boy is he one scary dude. Fiennes is always effective as a villain, and here he’s in top form. Like all characters in the film, he isn’t completely one dimensional; he has a set of principles that you can respect while fearing him. Beyond the Shakespearean plot and the Oscar-worthy performances, the film is also a love letter to the real city of Bruges. Shot on location, the cinematography of this gorgeous city makes you want to rush out and buy a plane ticket to Belgium. Having the film set in such a marvelous place is both a plot point and an addition to the experience. So, it’s been five months since I declared In Bruges the best movie of the year so far. That was February, and now it’s the end of June. And a little robot named WALL-E has come along and is rivaling In Bruges for the title “Best film of the year so far.” I can’t say whether WALL-E or In Bruges is the best film of the year so far, because they are so different. But with a plot that Shakespeare would be proud of and performances that define great acting, I can’t imagine any more movies rivaling In Bruges for the title this year. The visuals of In Bruges are definitely one of the film’s strengths. Watching the beautiful landscape of Bruges is part of the appeal, so a good DVD image is essential. Thankfully, the video quality here is more than acceptable, though not a home run. Colors are generally accurate, though sometimes a bit soft; flesh tones are extremely realistic. There’s a good amount of detail to the image, and the large panoramic shots of the city are faithfully recreated. The image definitely isn’t reference quality, but it is very accurate to the theatrical experience, and I was pleased. There’s nothing too complex about the audio track, and while it won’t blow you away, it’s as good as it needs to be for a dialogue-driven film. Dialogue is always clear, and Carter Burwell’s excellent score plays at a good volume, as do the sound effects. There’s a nice crisp quality to the audio that helps draw you into the experience. Despite some minor flaws, this is a very good A/V experience. For a film that few seem to have ever even heard of, In Bruges arrives on DVD with a very solid set of bonuses. Things start off with Deleted and Extended Scenes (18:20). There are 12 deleted scenes here, which run as one continuous reel. At least half of this is extra tourism scenes, and you can tell that the filmmakers shot tons of Bruges footage, and then whittled it down to the first half hour of the film. There’s a great line with villain Harry in one of the scenes, and some other fun moments spread throughout. All of these scenes were cut for a reason, but it’s cool to have them here nonetheless, and are an interesting watch. Next is a Gag Reel (5:59). This is your standard “laughter after messing up a line” sort of fare, but there are a few laugh out loud moments. The extras really get going strong with When in Bruges (13:48) which first details the origins of the project and then discusses the characters and plot. Usually, featurettes that simply tell us what we know annoy me, but this is actually really good. The actors all talk quite a bit about their roles, and hearing everyone’s interpretations on various moments and characters is interesting. Even the small parts are discussed by the actors who played them. Strange Bruges (7:27) is a nice featurette that discusses what it was like to shoot in Bruges, and it’s obvious that everyone on the project loves the town. Perhaps the most interesting feature is A Boat Trip Around Bruges (5:54), in which a camera is mounted on a boat, with the boat traveling around the canals of the city. You get to see a good amount of the beautiful scenery, and there’s a text track that plays on the top and bottom of the screen, giving interesting facts about the city. It’s set to music from the film, and is easily one of the best features on this disc. The final feature is called F**king Bruges (1:35) and is an entirely pointless reel of expletives from the film. Sometimes this is funny, but doesn’t fit with the theme of the extras. You get a solid hour of bonus features in total, and except for the swear reel, it’s all quality stuff. The things I wanted the most are absent, however, like a commentary with Gleeson, Farrell, and director McDonagh. A few years ago, McDonagh won an Oscar for a short film called Six Shooter, and while the film has no relation to In Bruges, it would have been cool to have on here. Still, everything we get is good and this is a solid extras section. On the presentation side of things, I do have a problem with the packaging. The disc is housed in a standard amaray case, but my copy (as well as the other ones at the store) is really flimsy, and not as sturdy as your standard DVD case. The front cover doesn’t feature Gleeson at all (like the DVD creators hated him); the original poster was awesome, and they should have used that. The description of the film on the back cover is woefully misleading; it’s trying to tell you that this is a fun, whimsical comedy, which it most certainly isn’t. None of this is really a problem, but it’s worth noting. With a Shakespearean-esque screenplay and Oscar-worthy performances, In Bruges is a film you can’t afford to miss, though it might not be everyone’s cup of tea. The film alone is worth the price of the disc, but you also get a fairly robust Extras section. The A/V quality is great, and overall, there’s no reason not to buy this disc.